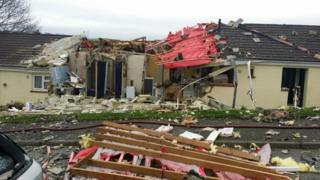 A "huge explosion" has destroyed a bungalow and injured two people. The suspected gas blast happened in Barn Park, Buckfastleigh, Devon, at about 07:50 GMT. A woman in her 70s was airlifted to hospital with "life-changing" burns while another person was treated for minor injuries at the scene. BBC presenter Michael Chequer said the blast "shook the house" and neighbours were evacuated. Another witness, Andy Stokes, said he was in bed having a cup of tea when he heard a "huge explosion". "I jumped out of bed and looked out of the window and saw a massive cloud of debris and dust rising," he said. "The whole roof of the house had been blown off and was lying in the street [with] smashed cars in front of it. "We obviously thought anybody in there would have a very little chance of surviving, it turns out there was a lady injured in there who managed to walk out." Police said there was "significant damage" to the bungalow and a cordon remains in place covering the Barn Park and Jordan Street area. Officers said they are working with the fire service to establish the cause of the blast. Wales & West Utilities said that the explosion was "not caused by the mains gas network", and it was supporting the emergency services in their investigation. The gas company also addressed reports that engineers had visited the property on Friday night. "We had not previously visited the affected property on Barn Park," a spokesman said. "Yesterday we were called to a smell of gas on Jordan Street. Our engineer conducted all the necessary gas safety checks and found no evidence of a gas leak."